Now that we've learned about the individual components, let's dive into encrypting our IoT communications with TLS, MQTT, and lwIP. One of the most important aspects of the ‘IoT’ world is having secure communication. 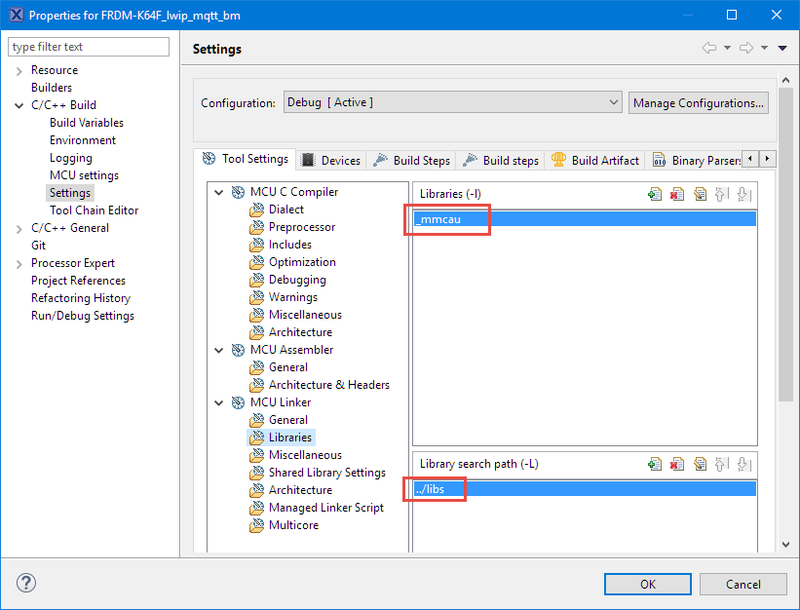 Running MQTT on lwIP (see MQTT with lwIP and NXP FRDM-K64F Board) is no exception. Despite the popularity of MQTT and lwIP, I have not been able to find an example using a secure TLS connection over raw/native lwIP TCP. Could it be that such an example exists, and I have not found it? Or that someone implemented it, but has not published it? Are others asking for the same kind of thing “running MQTT on lwIP with TLS” with no answer? So I have to answer my question, which seems to be a good thing anyway: I can learn new things the hard way. This article describes how to enable a bare-metal (no RTOS) in RAW/native (no sockets, TCP only) lwIP application running the MQTT protocol with TLS. The project used in this article is available on GitHub. The project runs an MQTT client application, which initiates TLS handshaking and then communicates securely with a Mosquitto broker. TCP based (raw) example, e.g. the lwIP TCP ping application (or the project from MQTT with lwip and NXP FRDM-K64F Board). 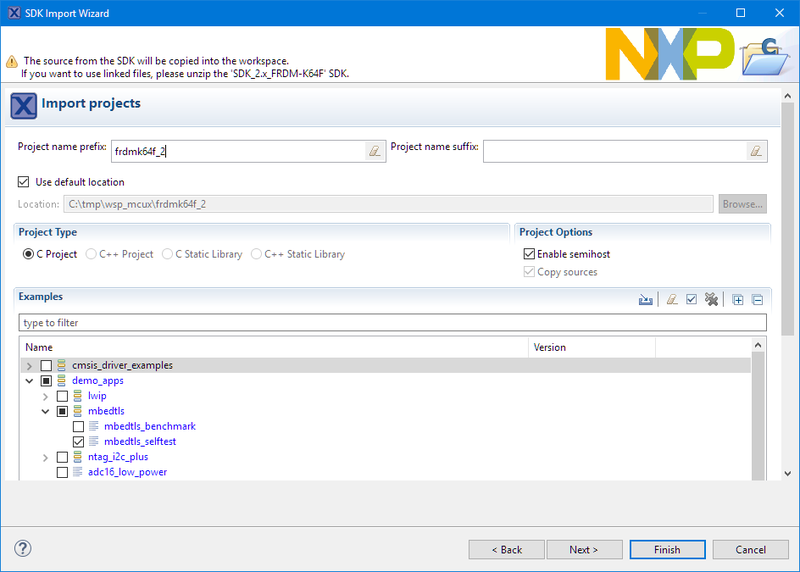 But any other software/tool combination should do it too :-). As outlined in Introduction to Security and TLS (Transport Layer Security), I have selected mbed TLS because its licensing terms are very permissive (Apache). 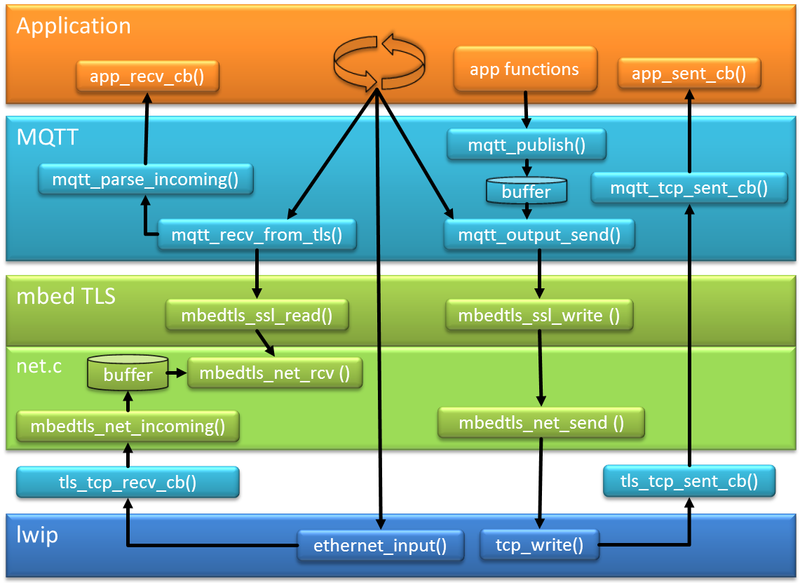 Get mbed TLS (I recommend the Apache version as it is permissive). The mbed TLS implementation uses a ‘port’ which takes advantage of the hardware encryption unit of the on the NXP Kinetis K64F device. 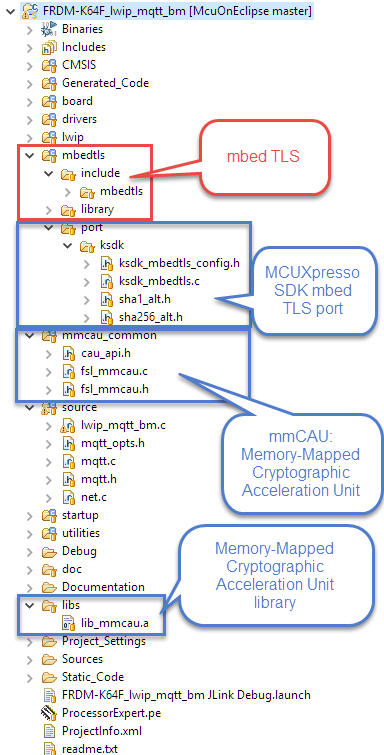 That ‘port’ is part of the MCUXpresso SDK, place it inside mbedtls\port. This completes the files and settings to add mbed TLS to the project. In raw/bare metal mode, the application calls ethernet_input() which calls the ‘received’ callback. 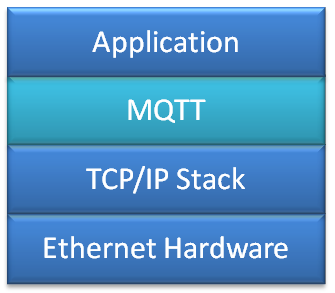 With using MQTT, the MQTT parses the incoming data and passes it to the application (e.g. CONNACK message). If the application is e.g. sending a PUBLISH request, that TCP message is constructed by the MQTT layer and put into a buffer (actually a ring buffer). 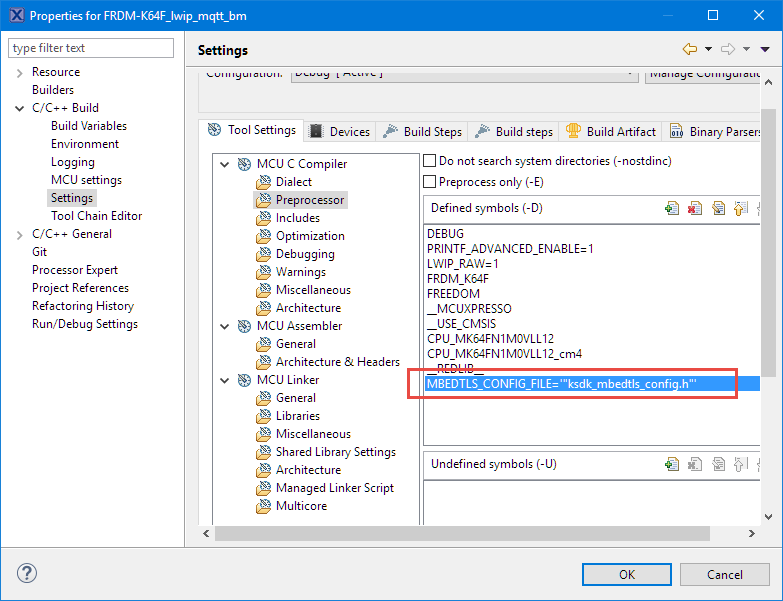 That data is only sent if the mqtt_output_send() is called (which is not available to the application). mqtt_output_send() is called for ‘sending’ functions like mqtt_publish() or as a side effect of the mqtt_tcp_sent_cb() callback which is called after a successful tcp_write(). 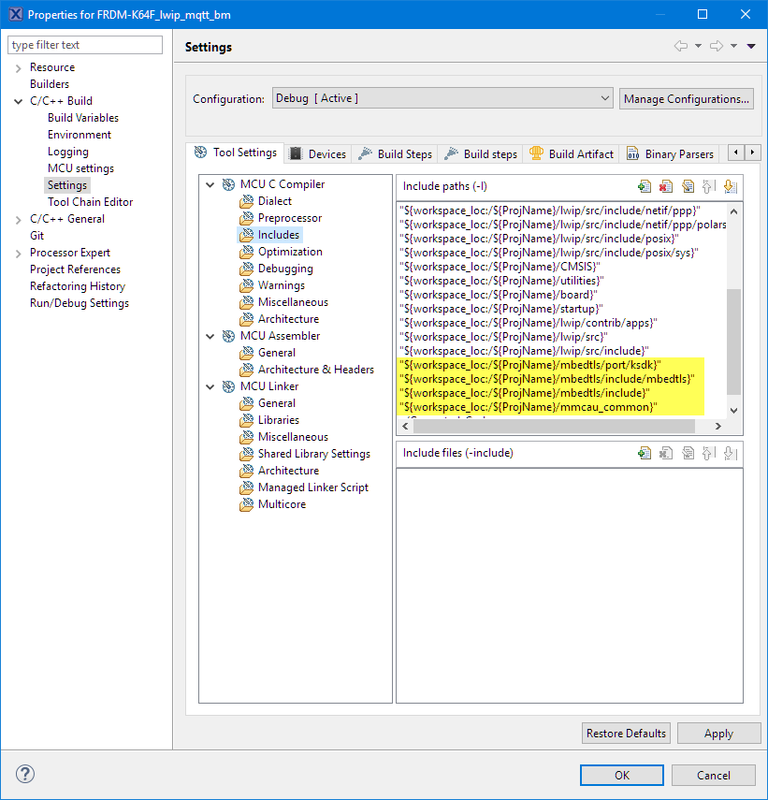 The MQTT sent_cb() is forwarded to the application sent_cb() callback. Now that we've done some of the legwork, next time, we'll start putting everything together. Part 2 will focus on combining TLS with MQTT, setting up our encryption in detail.